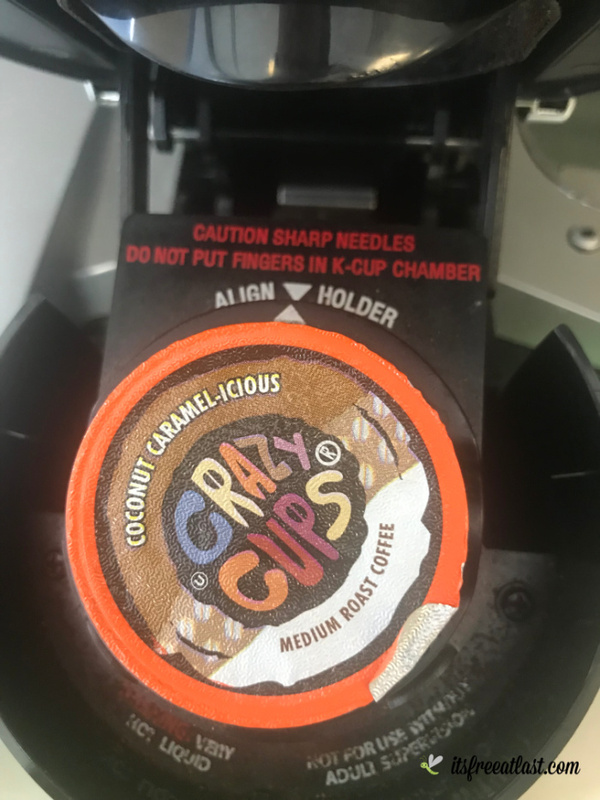 I know you are as excited as I am to see what is on tap in the way of flavors this month from Crazy Cups coffee! I am excited to share that this month brings a unique and sweet mixture of Coconut and Caramel in the Coconut Caramel-icious blend. They think the world should be a more flavorful place, which is why they created Crazy Cups.They’re chock full of the flavored coffees you’ve come to love, and wild new additions like Peppermint Chocolate Mocha, Pumpkin Vanilla Crème and Italian Chocolate Cheesecake. Flavored coffee not your thing? It’s all good. We’ve got you covered. You can start your day with a roar with Sumatran Tiger or get rid of the pesky caffeine with Decaf Delight. This month’s flavor is allows you to relax and get lost in a delicious cup of creamy coconut and decadent caramel flavor combination. It goes beyond your normal love of caramel and coconut flavors. It combines two great, dominant flavors together with the richness and bold coffee taste to delight the palate and heighten your senses a bit. Perfect on a cold winter morning! Crazy Cups Coffee Pods are Eco-Friendly! I know you have heard about the pods filling up our landfills, right? Well, with Crazy Pods you don’t have to worry! Crazy Cup pods are RECYCLABLE!!! You can enjoy deliciously flavored coffee guilt free! No worries about filling up landfills at all! Simply recycle the pods! Cool – Capsule is hot once brewed, allow a minimum of two minutes to cool. Peel – Carefully peel back the tab to separate top lids and remaining filter. Recycle – Discard capsules, lid and boxes wherever these recyclables are accepted. Crazy Cups offers you a chance to enjoy great tasting coffee and help the earth at the same time! Whether you like plain coffee or flavored, they are sure to have the perfect coffee for you! Where can you find Crazy Cups Coffee? 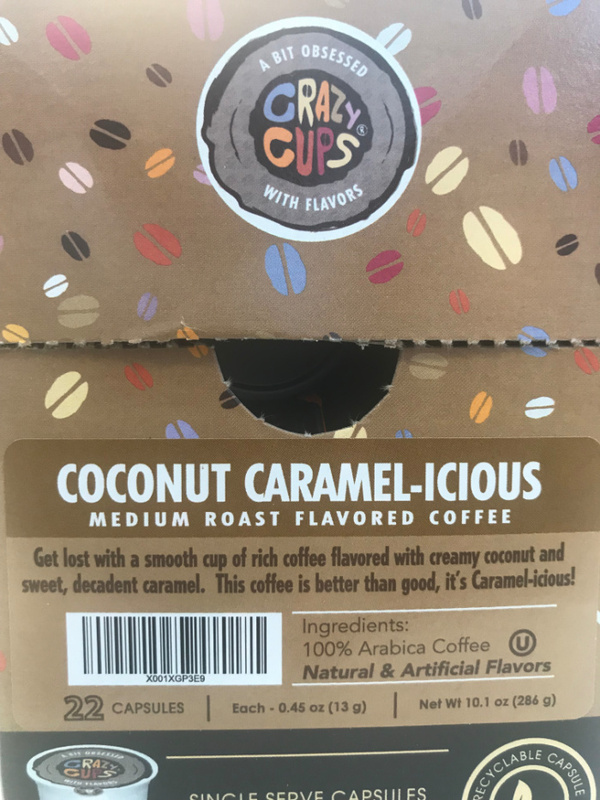 If you would love to try the delicious Crazy Cups Coconut Caramel-icious or other flavors of Crazy Cups, visit them online to see all the mouth-watering flavors and options! Be sure and stop back by next month to see what flavor we have to highlight!